This is a secure encrypted Internet transaction using a certified secure server. Purchasing your tickets online saves you time and money! 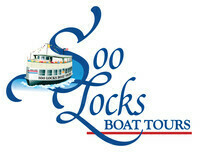 Experience 'locking through' the Soo Locks. Your narrator will explain the history and operation of the Locks as your boat is raised 21 feet straight up, to the level of Lake Supeior. Frequent departure times, 7 days a week. Tour is approximately 2 hours. Take a 4 1/2 hour St. Mary's River Lighthouse Cruise that navigates through the Soo Locks, where you can experience the fully intact lightkeeper's residence at Cedar Point and view the remains of the original lighthouse on Round Island. Enjoy our unique Special Cruises and New Cruise offerings throughout the sailing season.